With your dog spending up to 18 hours a day at rest, maintaining healthy joints is very important. These beds are therefore excellent for dogs with arthritic conditions or joint and limb problems. Woof-Bed is a memory foam dog bed, designed and made in the UK with human grade memory foam for maximum support. It will give your dog all the comfort and support they need to stay fit and healthy. 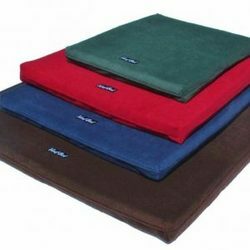 The removable covers are a soft wick away fleece that allows your dog to dry naturally without making the bed wet. Mud and dirt will hoover off and covers are fully washable. Woof memory foam dog bed is available in three sizes and four lovely colours and guarantees the best night’s sleep for your best friend!